From The Children’s Museum to the Eiteljorg to the Indianapolis Museum of Art, we are fortunate to have so many fine museums right here in Indianapolis. We are also fortunate that our home in the heart of the country puts us within a short drive to a wide-range of museum getaways. Check out our list of 5 museums worth the drive. Just a quick trip up the road in Fishers, Conner Prairie is one of the most visited outdoor museums in the country and Indiana’s first Smithsonian affiliate. Visitors can immerse themselves in 19th-century village life and interact with the people, animals, objects and routines of a bygone era in 1836 Prairietown; climb to the top of a four-story treehouse and explore the newly added Fort Hoosier play structure at Treetop Outpost; step into Indiana territory in 1816 Lenape Indian Camp; get in touch with nature at the new White River Overlook; head indoors for some hands-on activities in Create.Connect or the brand new Makesmith Workshop; or fly high above it all on an 1859 Balloon Voyage. With 11 incredible experience areas there is truly something for everyone. 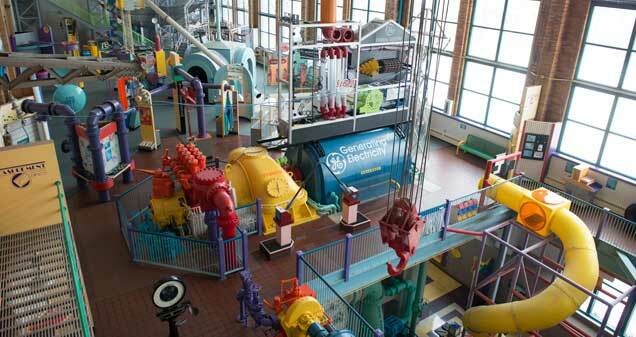 Located in an old power plant, Science Central houses 30,000 square feet of hands-on fun the entire family can enjoy. Test your kid’s sense of balance on the High Rail Bike. Be mesmerized by Science On a Sphere – the only exhibit of its kind in Indiana that offers a tool to understand earth and space systems in a three-dimensional format. Learn more about the weather, matter, the human body and other science topics during one of the museum’s interactive demonstrations. Little ones age 2-7 can enjoy a space all their own in Kids Central, which includes a giant piano keyboard, a water table and water play activities, bubble windows and the Fort Discovery play area. And now through Sept. 9, visitors of all ages can explore different environments of darkness and the unique life forms that inhabit them in the touring exhibit In the Dark. Just a short drive a way in Columbus, IN, youngsters can explore three floors of interactive fun at KidsCommons. Kids can discover the innovation of the city’s architecture and urban design while planning their very own community in City by Design. Get the ultimate bubble blowing experience in Bubble-ology, create a mini masterpiece in Kids-at-Art and investigate the science of optics and music with the Gateway Bridge Laser Harp. But the piece de resistance for kids of all ages is the giant toilet slide. You read that right – in ExploraHouse, kids can slide down the museum’s world famous giant toilet! Note: the building across the street houses The Columbus Commons – a giant, FREE indoor playground perfect for burning off some steam before the drive home. COSI is a world-class children’s museum that is just as fun for adults as it is for kids located in the other Columbus (Columbus, OH, that is). In the recently opened Dinosaur gallery, explore a 6-foot-long mechanical T rex model that walks in place, an 8-foot tall Titanosaur femur, a huge threehorned Triceratops cast and a 100-year-old piece of fossilized amber preserving an ancient feather. Little KidSpace is the perfect place for kids 6 and under to engage in pretend play, climb on play structures and get a bit wet at the water stations. COSI’s planetarium is the largest in Ohio and sends visitors on an unparalleled journey through our universe, while The National Geographic Giant Screen brings movies to life in stunning 3D. Visitors can also take a captivating journey through an ancient land in Traveling the Silk Road: Ancient Pathway to the Modern World on display through Sept. 3. Located in Dayton, OH, Carillon Historical Park celebrates the city’s rich historical heritage and numerous bragging rights – from being the birthplace of the airplane and the cash register to hosting the National Football League’s inaugural game. Featuring a hand-carved carousel, 4-D theatre, trains, slides, living history experiences, thousands of artifacts, extensive educational programming and so much more, Carillon Historical Park brings Dayton’s past to life in a way that is fun for the whole family. Highlights include the 151-foot-tall Deeds Carillon, the 1905 Wright Flyer III and the Great 1913 Flood exhibit that tells the story of Ohio’s worst natural disaster. And there you have it – 5 museums, tons of fun and all just a short drive away!